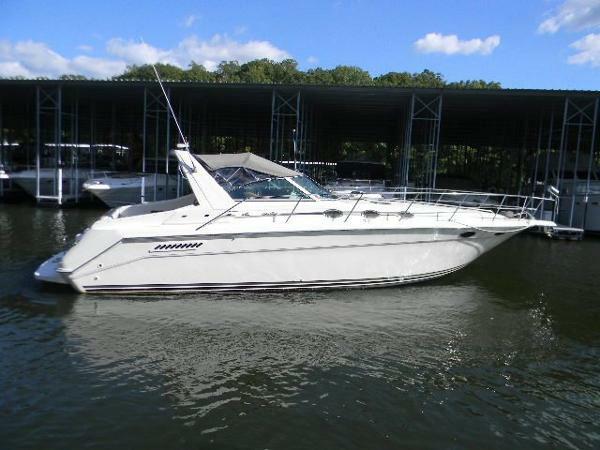 2000 Sea Ray 37 EC This 37 Sea Ray EC is extremely clean and maintained by a knowledgeable owner. Colorado Red is a must see with low hours on her Cat 3116 engines with recent service, recent bottom job, upgraded electronics and underwater lighting. 1997 Sea Ray 37 Sedan Bridge This 37 Sedan Bridge shows extremely well. There is all new canvas on the boat in 2016. The interior shows no wear and the bridge upholstery also shows very well. there is newer chart plotter on the boat also. 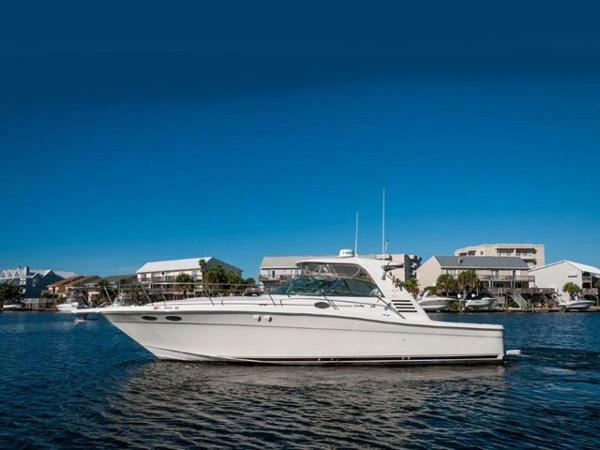 With low hours this boat will give you years of enjoyment with the family and friends. Call now to see this very nice 37SB. 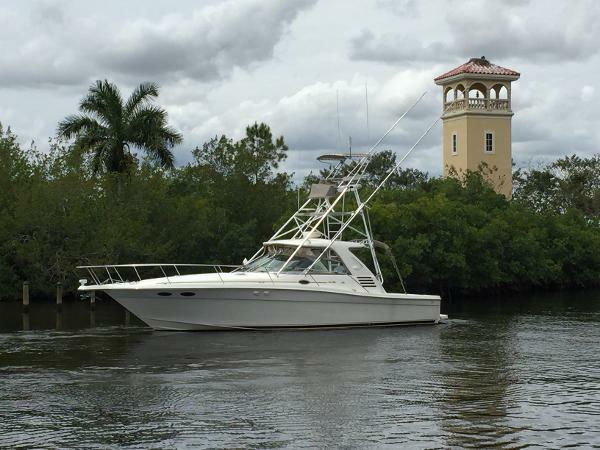 1998 Sea Ray 37 Express Amberjack Style THE MONEY IS SHOT is a wonderful example of a true 50/50 cruising/fishing boat. Her wide beam and gunwales, together with her dependable inboard Cat diesel engines makes it the perfect family fisherman. The boat is 1/3rd cockpit, 1/3rd helm deck, and 1/3rd captain - really she is the SUV for the water. Priced smartly for a boat of this size. Wonderful sea boat with easy manners around the dock. MOTIVATED SELLER, ALL OFFERS ENCOURAGED!!! 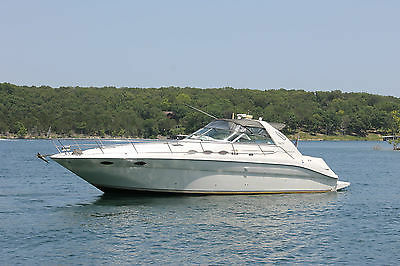 1999 Sea Ray 37 Express Cruiser 1999 Sea Ray 37 EXPRESS CRUISER with CAT 3116 diesels. More detail to follow. 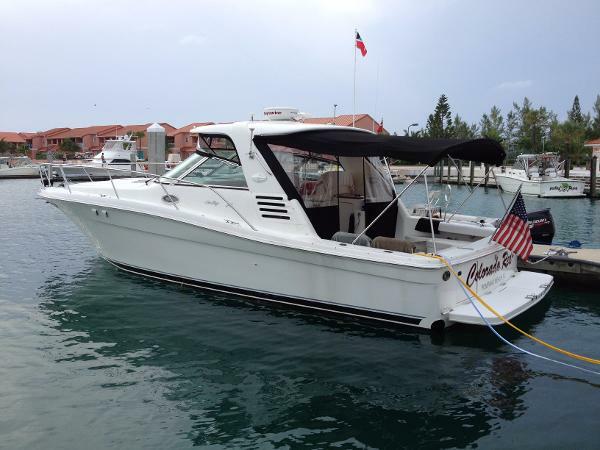 1993 Sea Ray 37 SUNDANCER 1993 Sea Ray 37 SUNDANCER. Owner wants her gone. In great working condition. AC runs cold/engines run strong. 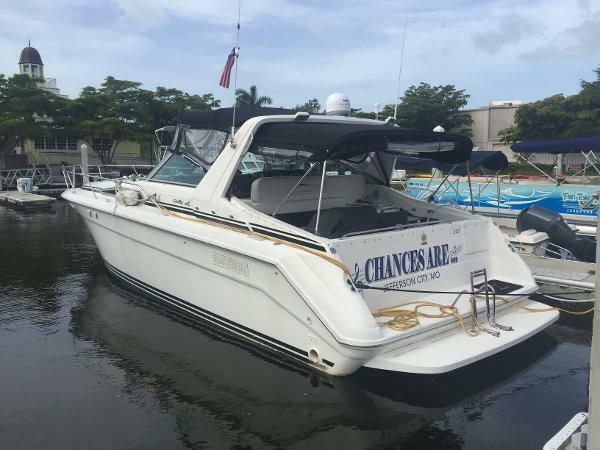 1993 Sea Ray 37 Express Cruiser 1993 SEA RAY 370 EXPRESS CRUISER w/ Twin 340hp MerCruiser 7.4L Direct Drives Here's an extremely nice Fresh Water only 370EC that has been kept with an open checkbook. Purchased originally from our location and all services have been performed by MarineMax Lake Ozark. In September 2015 the boat was bottom painted, waxed, buffed and services were performed on the motors and transmissions. 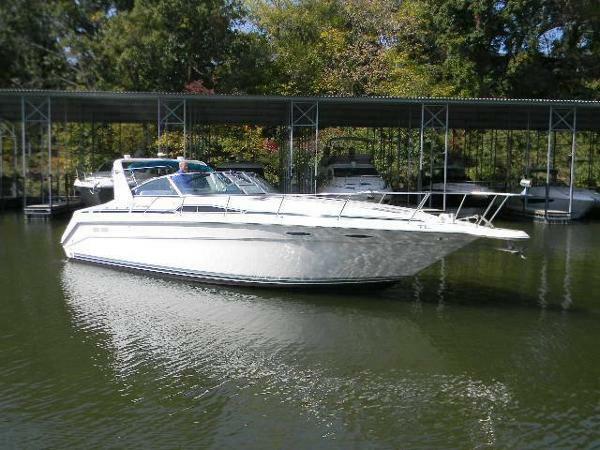 1994 Sea Ray 37 SUNDANCER 1994 SEA RAY 370 SUNDANCER w/ Twin 310hp MerCruiser 7.4L V-Drives Only 360 hours Here's a nice freshwater only 370 Sundancer that has had the cabin refurbished and has very low hours. A nice sized older cruiser for Lake of the Ozarks. Only 4 owners since new. Always on Table Rock Lake. Low hours and very well taken care of. In excellent condition with UPGRADES. White hull with grey canvas and enclosure. DimensionsLOA: 37 ft 0 inBeam: 12 ft 7 inLWL: 40 ft 1 inMaximum Draft: 2 ft 8 inBridge Clearance: 11 ft 2 inEngines: Twin Engine Brand: Mercruiser Year Built: 1995 Engine Model: 7.4-litre 310-hp V-Drive Engine Type: Inboard Engine/Fuel Type: Gas AccommodationsForward Stateroom: Island Berth & Privacy Door, Hanging Lockers, Drawer Storage, Flat Screen TV, Air-Condtioning and Heat unit #1.Settee w/Dining / Cocktail Table (Converts to Berth w/Filler-Cushion), Air-Conditioning and Heat unit #2.Aft / Mid-Cabin: w/Privacy Door/Curtain and Hanging Locker to Starboard, Large flat screen TV in Salon, Blu Ray player in Salon, AM/FM Stereo with CD Changer (Separate from Cockpit Stereo).GalleySink, Pressure Water System, Hot Water Heater, Power Vent, Refrigerator w/Freezer (New 2012), Stove (Electric), Microwave Oven, Coffee Maker, Central Vacuum System, Snap in carpet protector runners, In-Floor Storage (Carpeted)Head (Vacuflush) w/Vanity/Sink/Stall ShowerElectronicsCompass, Raytheon 202 VHF Marine Radio, Raytheon Tridata (Depth, Speed/Sumlog), AM/FM Stereo System w/ USB port.Electrical(3) Batteries, (2) Battery Switches, Battery Charger (New 2013), Emergency Start System, 12V Accessory Plug-In @ Helm, (2) 30-AMP Dockside Shorepower Plug's w/Cord, Dockside Cable TV Plug-InDeck(4) Forward Deck Hatches w/Screens, Sun CushionsCockpitCockpit Wet Bar w/Sink (Storage Underneath), Refrigerator, Cockpit Table, Power Windshield VentWindlass Anchor, Anchor Locker, Transom Shower, Radar Arch, Transom Door, Swim Platform w/Boarding Ladder, Power Helm Seat, Cockpit Carpet (Snap-in Snap-out), Remote Control Spotlight, Cockpit Heat / Defrost, Tilt Steering Wheel, Camper Top Canvas w/Full Enclosure, Flat Screen TV, AM/FM CD player with separate control at back of boat. 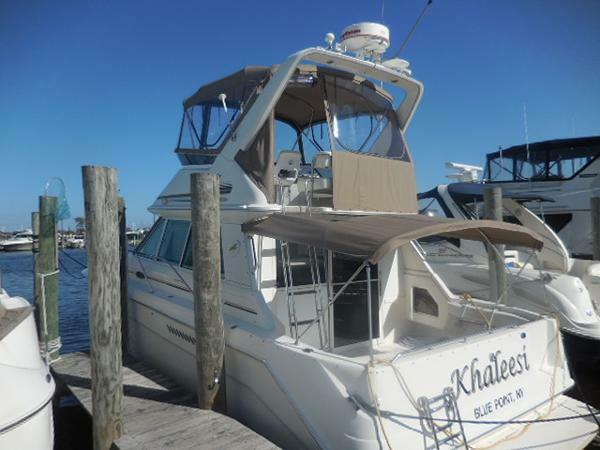 Boat is also broker listed so any bid or offer is subject to cancellation if sold outside of Ebay prior.